With Mattermark, you can sort through over 1.4 million privately owned companies based on location, total funding, industry, employee growth month over month, total employees, Growth Score, Mindshare Score, and much more. We did a simple search to surface the fastest growing startups in Los Angeles by choosing the region, stage (not exited), total funding < $10M, excluded the biotech and pharmaceutical industries, and employee growth month over month >1%. This Advanced Search surfaced 27 unique companies with products ranging from an all-in-one business management tool, an alcohol delivery app to drone airspace mapping software and an ‘upgraded’ coffee beverage. In the list below, we’ll showcase the top 15. As a baseline, you can use this pre-written search (Mattermark login required) to jumpstart your own research. The search results will change over time based on individual company performance. 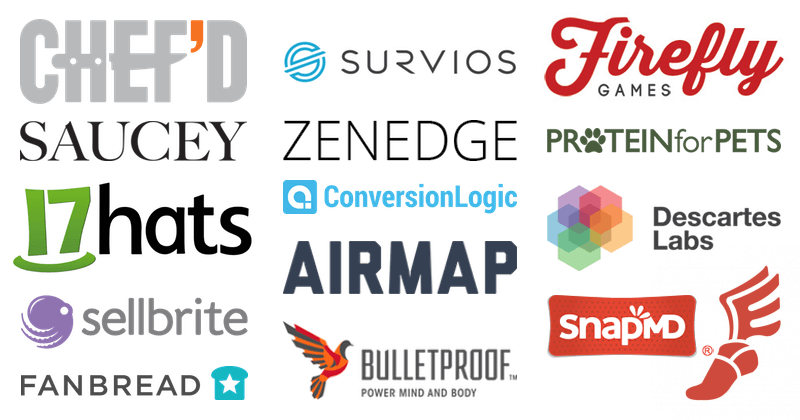 We’ve used the Mattermark Growth Score to rank these companies. To see more free data on these companies, follow the links below. 1.Chef’d (Mattermark Growth Score: 646) – Ready-to-cook recipe kits with fresh ingredients, created by your favorite chefs, and delivered to your door. 2. Saucey (Mattermark Growth Score: 552) – Offers Beer, Wine, Spirits delivered at the push of a button. 3. 17Hats (Mattermark Growth Score: 529) – The all-in-one business management tool helping entrepreneurs do their work anytime, anywhere. 4. EnvoyNow (Mattermark Growth Score: 461) – An on-demand food delivery app capitalizing on the underserved college market. 5. Sellbrite (Mattermark Growth Score: 444) – List and sell your products on eBay, Amazon, Shopify, Etsy and other channels to access more customers and maximize your sales, quickly and easily. 6. FanBread (Mattermark Growth Score: 379) – A one-stop shop for influencers to build their own branded mobile websites with all the best money-making tools built in. 8. AirMap (Mattermark Growth Score: 288) – Helps to make drones a part of everyday life by building the foundations for the low-altitude air navigation systems of the future. 9. Conversion Logic (Mattermark Growth Score: 223) – Advanced attribution SaaS solution focused on solving video measurement. 10. Zenedge (Mattermark Growth Score: 217) – Web Application Security, Web Application Firewall, WAF, DDoS, OWASP Top 10, malware, Heartbleed, Shellshock, and zero-day vulnerabilities. 11. Survios (Mattermark Growth Score: 167) – Creates groundbreaking interactive content powered by cutting edge consumer electronics. 12. Protein for Pets (Mattermark Growth Score: 161) – An affordable, all-natural, pet food store that’s organized by protein type rather than brand. 13. Descartes Labs (Mattermark Growth Score: 151) – A deep-learning image analysis startup focused on turing satellite imagery into useful data. 14. SnapMD (Mattermark Growth Score: 143) – Telemedicine technologies that connect healthcare providers to their patients. 15. Firefly Games (Mattermark Growth Score: 136) – Bringing the most global community focused mobile games to gamers all over.